This photo guide will help you identify the most common store fixtures used in retail to display merchandise including garment racks, counter displays, wall units, mannequins, and more. 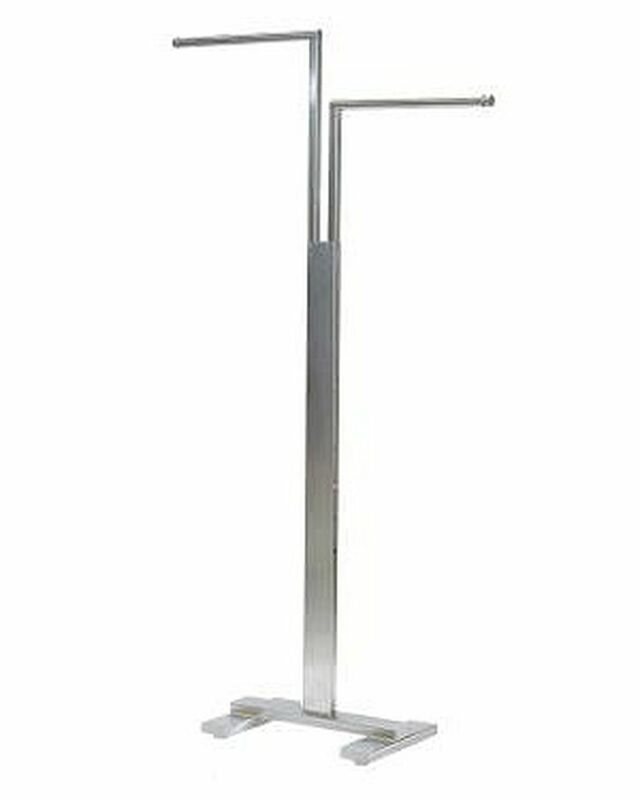 Used as a traditional and economical way to display hanging clothing, these 2-way garment racks are adjustable and most commonly available in a chrome finish. Retailers have a choice of straight or slant arms, round or rectangular tubing with a flat base or on casters. Merchandise obviously sells better when it is properly displayed. There are many types of counter racks and accessory displays to show off small products and accessories. Accessory displays come in acrylic, glass, leather, velvet, wire, and even cardboard. The small footprint of counter racks is excellent for use near the checkout in a retail store or at flea markets and trade shows. Similar to the 2-way rack, the 4-way garment rack offers a traditional and economical way to display hanging clothing. It is adjustable and most commonly available in a chrome finish. Retailers have a choice of straight or slant arms, round or rectangular tubing with a flat base or on casters. Body forms and mannequins bring fashion to life in a small selling space. Dressed models showcase clothing more effectively, and create more interest than clothing sold from display racks. There are many styles of mannequins available to retailers today, from the traditional torso and full-body forms to modern wire forms. A retailer favorite, the round rack comes in several sizes. The circular rack supports a shelf or basket, has adjustable legs and comes in a chrome or black finish. Available in round or rectangular tubing. Glass, plastic or wire cubes on a laminated base can be purchased together as a unit or designed from your own plan. Cube units work well for related items that may need dividers or other configurations for merchandise like clothing in various sizes and colors. These types of displays also offer flexibility when you need to tailor displays to a store or booth with small spaces or unusual dimensions. Gridwall gondolas, displays, and grid merchandisers are lightweight, flexible fixtures. Generally available in black, white, or chrome, grid fixtures allow retailers to display a larger volume of merchandise in a smaller space. Grid fixtures are mobile and offer a sleek look to modern retail stores. These highly functional pieces are great for window displays, on the sales floor, or even trade shows. Gondolas and merchandisers constructed from slat board bring a modern look to any retail store. These store fixtures must be used with metal Slatwall hooks or shelves. This convenience offers retailers a flexible platform for creating stunning visual displays. Slat board is available in many different laminated finishes and wood grains. You can also get paint-grade Slatwall, which allows you to paint it your own custom color. Slat board is heavy so be sure your merchandisers are on casters for more versatility. Slat board is available in many different laminated finishes and wood grains, and paint-grade Slatwall allows you to paint your own. Slatwall hooks, shelves, brackets and other slat board accessories help improve merchandising and sales. Slatwall fixtures have considerable weight so you may be limited to certain wall areas if you choose to hang the slat board. Full vision showcases allow retailers to display a wide range of items such as jewelry, electronics, and more. Sliding doors, locking mechanisms, interior lighting and adjustable shelves offer several easy to view levels of display. Half-vision display cases offer the best of both worlds. They're excellent for products needing high visibility and they also have a concealed clerk-side storage area. Adjustable shelves, locking doors and optional interior lighting complete the half-vision showcase. Curved or standard wrap counters are used for storage, rather than display. Modular units built with adjustable shelves are available in laminates or solid wood finishes. The wrap counter (or cash wrap) can hold bags, store-use items and more. The shelves face inward, and allow you to place a cash register on top, while storing bags, tissue, and other supplies on the shelving below, out of sight. Cash register stands may have a flat top but generally, feature a recessed top to allow the cash register or POS system to sit securely. Undercounter storage with one or more adjustable shelves allows retailers to hold bags, tissue, boxes, and more in the checkout area. You can find these in a variety of glass and wood finishes. This corner rack ties together several common store fixtures to create an attractive and functional checkout area. It includes shelving for additional product display areas and impulse-purchase items. Gondola shelving units have been around for a very long time. The versatility makes gondolas easy to install and change on a frequent basis. The pegboard backing and shelving comes in several heights and depths. It is also available in a variety of colors, but the most common is almond because it's a neutral color that showcases products well. Gondola shelving can be used to create end caps, wall units or center aisles. The dump bin is a classic in the retail space. Perfect for promotional or clearance items, dump bins and dump tables work well for smaller products and will draw in customers when placed near the front of the store. Variations such as stacking baskets, spinning dump racks, hanging bins and other utility tubs are generally durable and inexpensive.